When setting up a transducer in SMARTset, you can add a scale and offset that will be applied to readings as they are received. 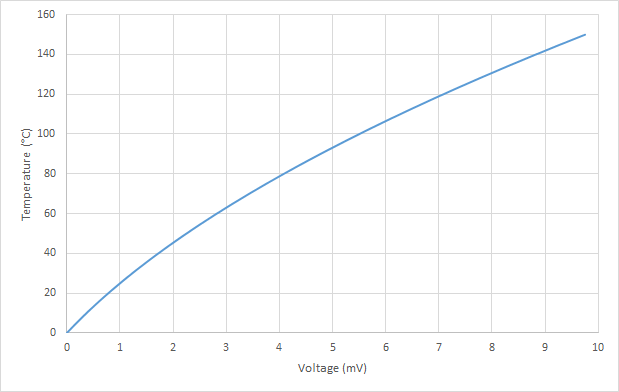 This is useful for unit conversion (if a voltage sensor gives readings in millivolts, and you want a reading in volts, for example), and is required for some types of sensors to convert a raw reading into a meaningful value. However, for other sensors, a simple linear scale and offset may not be enough. Thankfully, SMARTset has now added a new feature to transducer scales called Lookup Tables – these map any number of output values from a transducer into input values for SMARTset to describe a non-linear relationship. Data points are added as rows in a table, and when a reading comes in, it’s value is looked up in this table. If the exact value of the reading isn’t found, it is interpolated between the two nearest values. 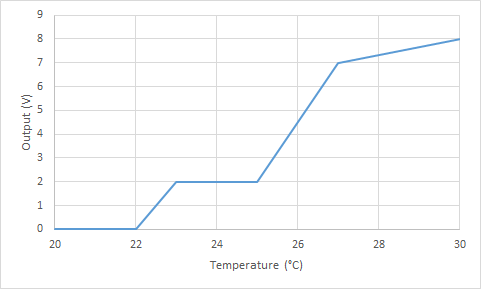 This graph shows the profile of a typical thermocouple – as you can see, a linear scale and offset wouldn’t quite fit this curve, so the lookup table is needed for maximum accuracy. Values from the sensor’s data sheet can be copied straight into the lookup table.